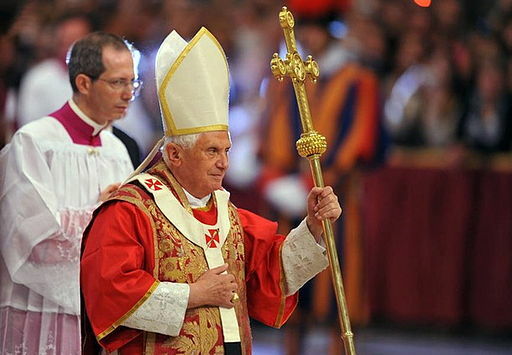 About a year ago, the Vatican released a letter written by Pope Benedict in which it had intentionally deleted Benedict’s specific reference to the great encyclical on Catholic morality (written by Pope John Paul II), Veritatis Splendor. When the redaction was discovered, the whole matter was very embarrassing to the Vatican (and, as it turned out, in light of the full letter, one could see that Pope Benedict XVI vigorously defended the magisterial authority and importance of Veritatis Splendor). Just this past week, Pope Benedict XVI released a new letter in which he once again brings to the Church’s attention the critical importance of VERITATIS SPLENDOR, and this in the specific context of the horrible sexual morality crisis confronting the Catholic priesthood and the Church. “Pope John Paul II, who knew very well the situation of moral theology and followed it closely, commissioned work on an encyclical that would set these things right again. It was published under the title “Veritatis splendor” on August 6, 1993, and it triggered vehement backlashes on the part of moral theologians. Before it, the “Catechism of the Catholic Church” already had persuasively presented, in a systematic fashion, morality as proclaimed by the Church…. Pope Benedict then tells us that Pope John Paul II’s encyclical on Catholic moral theology, Veritatis Splendor, “was published on August 6, 1993 and did indeed include the determination that there were actions that can never become good,” which “were always and under all circumstances to be classified as evil” (my emphasis). “Each of us knows how important is the teaching which represents the central theme of this Encyclical and which is today being restated with the authority of the Successor of Peter. Each of us can see the seriousness of what is involved, not only for individuials but also for the whole of society, with the reaffirmation of the universality and immutability of the moral commandments, particularly those which prohibit always and without exception intrinsically evil acts” (No. 115). Again I repeat, Emeritus Pope Benedict XVI has now authored two letters to the Church during the Papacy of Pope Francis. In both letters he has specifically highlighted the importance of Veritatis Splendor to the Church. Do you get what he’s trying to say? The Vatican (or at least the responsible agents therein) was so disturbed by Pope Benedict’s reference to Veritatis Splendor in Benedict’s first letter that they redacted it. Now, in a second letter, Pope Benedict is once more calling our attention to Veritatis Splendor, and this in special reference to the immorality crisis in the Church. “When a bishop acts in persona Christi, fulfilling his duty to teach on matters of faith and morals by identifying propositions to which he calls upon the faithful to assent, he presumably means to state truths that belong to one and the same body of truths: primarily, those entrusted by Jesus to his Church and, secondarily, those necessary to preserve the primary truths as inviolable and/or to expound them with fidelity. Since truths like these cannot supersede or annul one another, papal or other episcopal statements made while teaching in persona Christi must be presumed to be consistent with one another when carefully interpreted. Thus it is a misuse of such a teaching statement to claim its support without having first sought so to interpret it. In light thereof, Pope Francis was under every obligation to follow the clearly authoritative Veritatis Splendor for the reasons stated above. Moreover, the point would seem abundantly clear, and it is abundantly important to the future of the Church – where Amoris Laetitia contradicts Veritatis Splendor, especially where Amoris attempts to call good actions which can never be called good (as in nos. 301-303), such an interpretation of the moral law is, ipso facto, invalid as violative of the clear prohibitions in Veritatis Splendor. Image Attribution: Pope Benedict XVI celebrates a solemn mass on the occasion of the 50th anniversary of the death of Pope Pius X. By: Mangouste 35. October 9, 2008. This file is licensed under the Creative Commons Attribution-Share Alike 3.0 Unported, 2.5 Generic, 2.0 Generic and 1.0 Generic license (per Wikipedia).